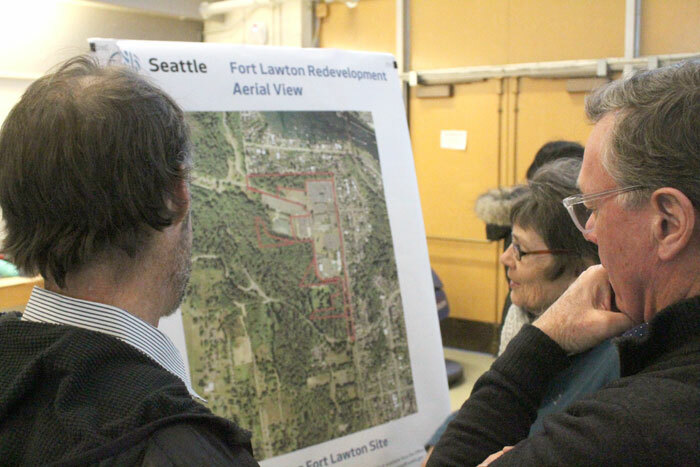 Photos by Brandon Macz: The Office of Housing held an open house and public hearing for its Fort Lawton Redevelopment Plan on Monday, March 4. 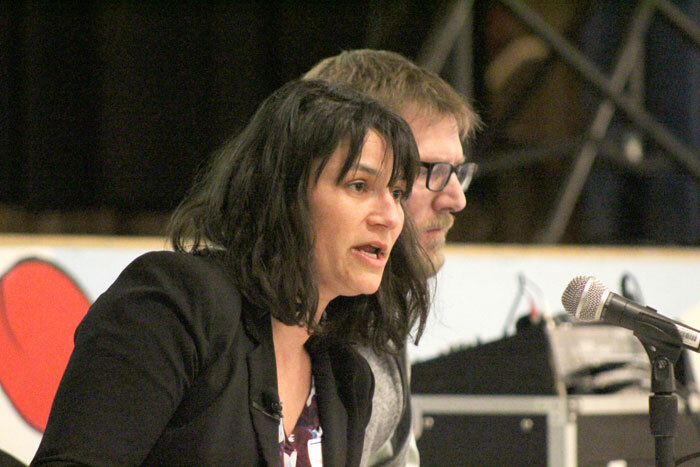 Emily Alvarado, manager of policy and equitable development for Seattle’s Office of Housing, and OH director Steve Walker led the public hearing on Monday, March 4. 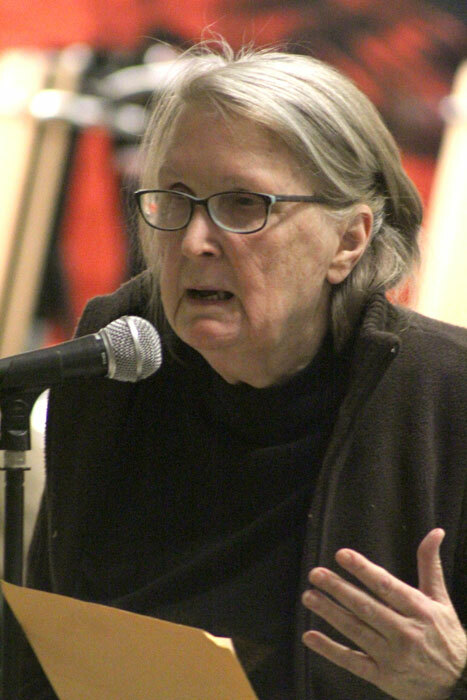 Housing advocate Laura Loe Bernstein was among those who spoke in support of the Fort Lawton Redevelopment Plan. Seattle City Councilmember Teresa Mosqueda says her housing committee will hold at least two public hearings before forwarding the plan to the full council. Neighborhood Safety Alliance leader Gretchen Taylor speaks against the redevelopment plan. Magnolia resident Mary Steele-Klein said the plan would result in the 'permanent ghettoization of low-income people' and unattended children everywhere. The Office of Housing took public comment Monday about its plans to redevelop the Fort Lawton site on Magnolia Bluff, with most comments either in favor of helping low-income Seattleites or expanding what is already the city’s largest public park. March 6 was the deadline to comment on the Fort Lawton Redevelopment Plan. The Office of Housing is incorporating the feedback and then submitting the plan for city council approval. 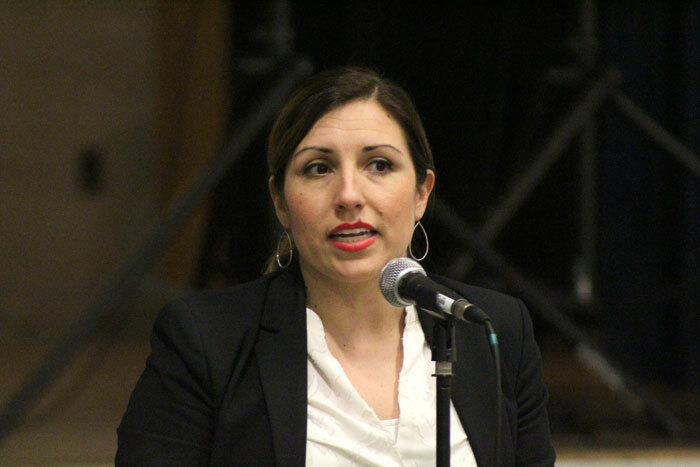 Seattle City Councilmember Teresa Mosqueda, who chairs the council’s housing committee, said she expects to hold at least two public hearings there in April. Mosqueda said Seattle must maintain access to green spaces as the city increases in density. “As we create greater density, these parks are our backyard,” she said. The 34-acre Fort Lawton site could be turned over to the city and its nonprofit partners at no cost, the former 70th Regional Support Command headquarters being offered up to the city by the Base Realignment and Closure Commission in 2005. 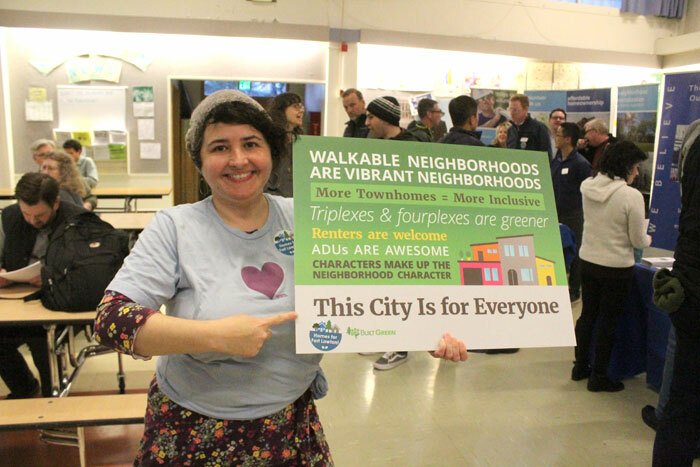 Magnolia resident Elizabeth Campbell and her Discovery Park Community Alliance group successfully challenged the original plan for a mixed-income housing redevelopment, arguing the city didn’t follow BRAC guidelines during the process. Following increased public outreach and engagement, the city came up with a 2008 Fort Lawton Redevelopment Plan, but market feasibility at the time required a “refresh,” said Emily Alvarado, manager of policy and equitable development for Seattle’s Office of Housing. The proposed Fort Lawton Redevelopment Plan now calls for creating more than 230 affordable housing units and 21.6 acres of parks and recreation area. Catholic Housing Services is collaborating with the city to create 85 supportive housing units for homeless seniors and veterans and 100 affordable rental units. Habitat for Humanity will create 52 units of affordable ownership housing in the form of three-bedroom townhomes and six-unit rowhouses constructed with sweat equity. Habitat for Humanity CEO Brett D’Antonio tells Queen Anne News the largest portion of the project will be funded through mortgages from homebuyers, followed by private donations. The nonprofit will also seek State Housing Trust funding. Habitat homes will be available to families making 30-80 percent of area median income (AMI). D’Antonio said it typically takes a year on other projects for a homebuyer to go through the application process and 500 hours of sweat equity to build a home. Habitat also provides classes for first-time homebuyers. The Fort Lawton site is anticipated to be granted by the federal government through public benefit conveyances. The Habitat for Humanity portion of the redevelopment currently qualifies for a discounted sale price up to 75 percent, D’Antonio said, but a request to have the land granted at no cost will be made. Alvarado tells Queen Anne News the Office of Housing will seek federal approval of the redevelopment plan once it is approved by the city council, and then seek the necessary conveyances. “It will still be a long process while we do construction and financing and permitting,” she said. BRAC approved of the city’s redevelopment plans in 2008, Alvarado said, so the hope is that it will approve the latest plan, which was briefly held up by an appeal of the final environmental impact statement by Campbell and Discovery Park Community Alliance. The Seattle Hearing Examiner affirmed the FEIS in late November. Working public comments received on the plan, including the roughly 80 who testified at the March 4 public hearing, into the redevelopment plan could lead to some changes, but only if they are consistent with the approved environmental impact statement, Alvarado said. Many speaking in opposition to the redevelopment plan on Monday argued the site should be used to expand Discovery Park. Alvarado clarified ahead of the hearing that the Fort Lawton site is not a part of Discovery Park. Opponents also argued that Fort Lawton is too far from public services and employment to be a feasible location for new residents. “Fort Lawton is probably the most isolated property in all of Magnolia,” said resident and Neighborhood Safety Alliance leader Gretchen Taylor. Magnolia resident Mary Steele-Klein said the plan would result in the “permanent ghettoization of low-income people” and unattended children everywhere. Housing Development Consortium operations manager Dan Cantrell was among a number of speakers in support of the plan. Queen Anne Helpline program manager Lisa Barnes, speaking as a Magnolia resident, suggested using some of the open space planned for the Fort Lawton redevelopment as a P-Patch, which she said would help bring the neighborhood together. Magnolia resident Dan Russell said he supports the project, but believes the city needs to work with King County Metro to expand and add bus lines there. Magnolia resident Neal Starkman said he’s in favor of more affordable housing, but not near Discovery Park, which he said is a quiet, pristine haven from Seattle’s urban environment. Magnolia resident Terry Cook said the redevelopment plan is critical to housing seniors and veterans, and that their lives shouldn’t be traded for more park space. She added a majority of the affordable housing residents would be at income levels of $42,000 or more, and would not be as isolated as opponents say. The redevelopment plan calls for 206 parking spaces for residents and another 60 spaces for parks and playfields visitors. Seattle Public Schools will use six acres to create two multipurpose fields. Friends of Discovery Park board member James McIntosh encouraged the city to create as much open space as possible in compliance with the Discovery Park Master Plan from more than 40 years ago. Campbell did not provide public comment, but did attend the meeting with fellow Discovery Park Community Alliance members, passing out fliers promoting the annexation of the Fort Lawton site into the park. The group’s latest attempt to sideline plans for affordable housing redevelopment came last week with the nomination of two Fort Lawton buildings for city landmark preservation status. Seattle Landmarks Preservation Board coordinator Erin Doherty confirms she received nominations for Harvey Hall, 4510 Texas Way West, and Leisy hall, 4570 Texas Way West, but the applications were incomplete. 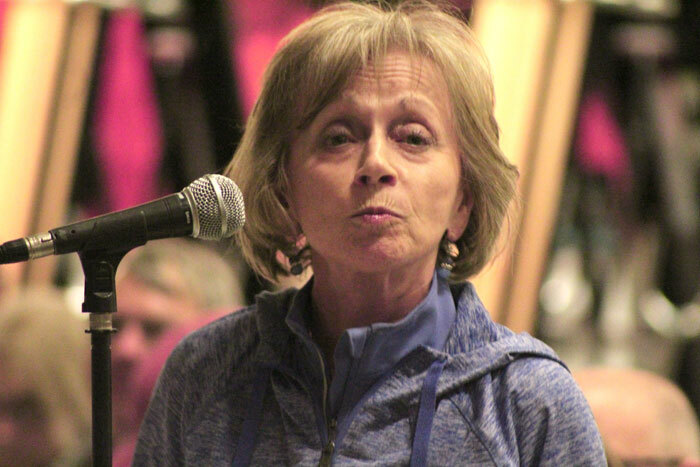 “When they are determined to be complete applications and are scheduled for a Landmarks Board meeting they will get posted to our website under ‘Current Nominations,’” Doherty writes in an email response to Queen Anne News. Comments about the redevelopment plan can be submitted at housing@seattle.gov.